First Holy Communion is a very special time in a little girl's life. Celebrate this meaningful day with a commemorative doll that will be cherished for years to come. 8 inch Wendy has a beautiful blond updo hairstyle and is made of vinyl with traditionally articulated arms and legs. 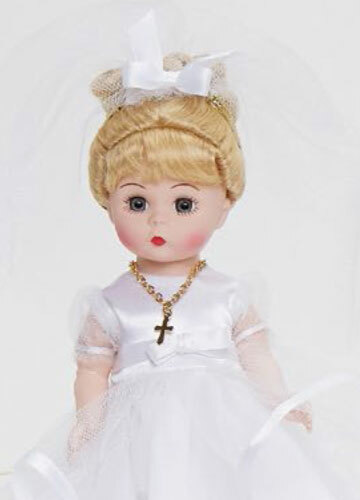 My First Communion Blond has a Light Skin Tone and is also available with brunette hair and medium skin tone. Part of Madame Alexander's 2016 Special Occasions Collection. Suitable for ages 14 and up.